Polyverse Music is an audio software company dedicated to collaborations with the most innovative musicians of our age to create musical instruments and tools for fellow musicians. They picked psy-trance duo Infected Mushroom as the first artists to work with and released “I Wish” note freezer plug in. After developing Erez Eisen’s initial idea into a prototype plugin, Infected Mushroom went to the studio to try the plugin, and discovered numerous other uses and features for it than originally anticipated. Polyverse uses this artistic feedback as the fuel for their creative engine. “Manipulator” is the latest release from the collaboration between Polyverse and Infected Mushroom and they will continue to collaborate with other genre bending artists in the near future. 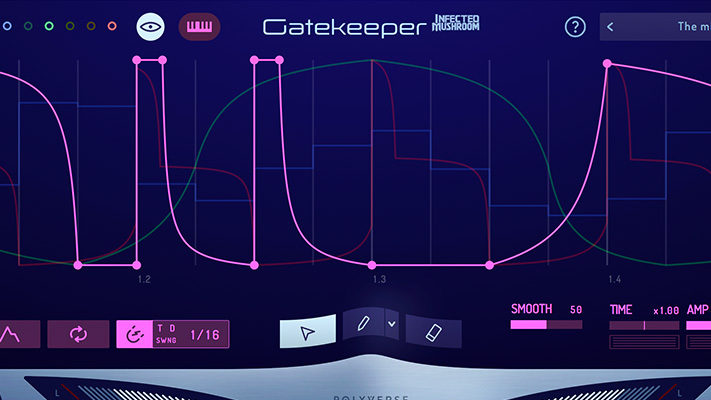 Gatekeeper is the cutting edge of volume modulation.